Tower Cranes – How are they Built? Tower cranes have been an integral part of the construction of thousands of buildings, monuments and other important structures worldwide. A recent article at the Daily Journal of Commerce website offers a thorough description of what is involved in setting up a tower crane. But before we look at how they’re set up, it’s important to understand which category will be used. Tower cranes typically have two configurations: luffing jib or trolley jib. Luffing jib tower cranes look much like their mobile crane counterparts that are ground-based. The arm “luffs” by pivoting up and down. Trolley jib tower cranes feature a horizontal jib arm with a trolley assembly. The load is positioned as the assembly moves along the length of the trolley. The tower cranes used by Sims Crane are the trolley jib configuration. Erecting a tower crane requires weeks of preparation. Unlike mobile cranes that are driven to and from the worksite and can be repositioned fairly quickly, tower cranes require a great deal of planning. In addition to engineering and design of the building, budget, transportation and scheduling must be considered. Once the location for the tower crane is established, a secure base must be constructed. The configuration of the entire project, plus local building code requirements, will determine how much concrete is needed for the base. In general, the weight of the base usually exceeds 400,000 pounds. Mounted to that base is the first section of vertical mast. The remaining sections of the tower crane are then transported to the work site and the rest of the vertical mast is assembled with the help of a mobile or crawler crane. Next, the operator’s cab and turntable are added to the top of the vertical mast. The horizontal jib is connected to the turntable, which extends from the front of the cab, along with the trolley mechanism, hoist and hook. Lastly, a counter jib is added which extends from behind the cab. Counterweights, motors and electronic systems are located here. Together, these elements provide the various functions needed for lifting. 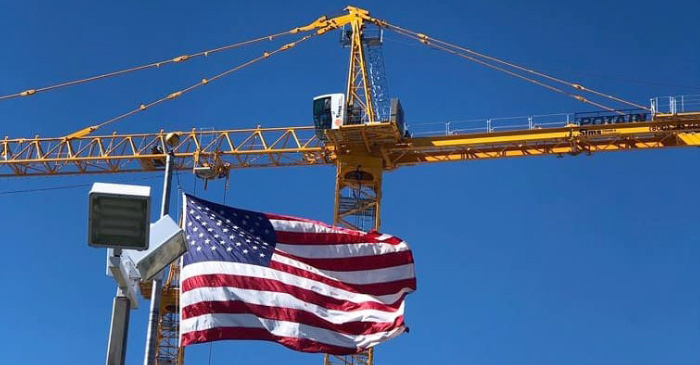 Read “Tower cranes 101: Here’s how they put ‘em up and how they take ‘em down” at Daily Journal of Commerce by clicking here.